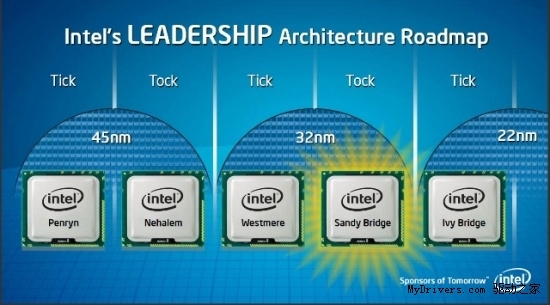 According to Media Reports, Intel have delayed their upcoming 22Nm Ivy Bridge CPU’s. The Ivy Bridge platform is now scheduled for Launch in Q2 2012 rather than its traditional Q1 Launch, Date cannot be confirmed yet. This goes for both the Desktop and Mobile processors which would only release after first 3-4 months of 2012. This shows that Intel’s “Tick-Tock” strategy has proven to be slower, The Tick Tock strategy shows the new manufacturing processes and core architecture upgrades Intel would be releasing year by year. The Sandy Bridge and Westmere i series 32nm processors were launched this year while the chart shows the 22nm chips would arrive in Q2 2012. Its upto Sandy Bridge lineup to compete against the AMD’s Bulldozer upcoming lineup of Zambezi-FX CPU’s which offer better performance for the same price as detailed here. More details on Intel’s Sandy Bridge-e and Ivy bridge here.